About 24 hours earlier, it was revealed that a Toyota Hiace bus was discovered in the same pond where General Alkali’s car and other vehicles were found in Jos, Plateau state. 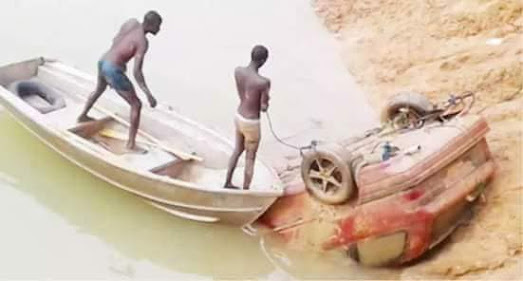 Another vehicle, a red saloon car with registration number Bauchi (AG 645 TRR), has been recovered from the old mining pond in Lafendeg, Du District of Plateau’s Jos South Local Government Area of the state. Missing army general, Alkali’s vehicle was pulled out of the pond nine days after the joint task force constituted by the Chief of Army Staff, Major-General Tukur Buratai, commenced pumping water from the pond into an opposite one. The white Toyota Hiace (RYM 307 XA) and its driver allegedly went missing three months ago. A thorough investigation needs to be carried out about that town.